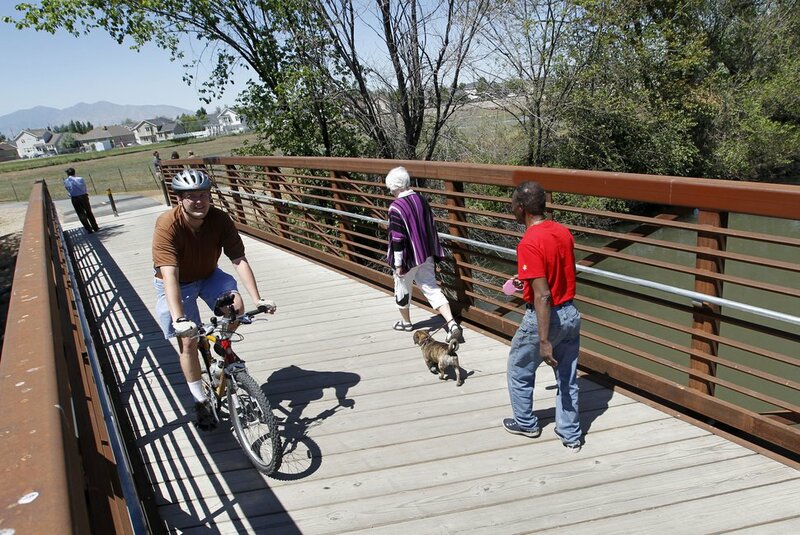 Salt Lake City celebrates the opening of a new $6 million recreational bridge between North Temple and 200 South. (Steve Griffin | The Salt Lake Tribune) The Fisher Mansion in Salt Lake City, pictured Wednesday, Nov. 8, 2017. (Steve Griffin | The Salt Lake Tribune) The Fisher Mansion in Salt Lake City was built in 1893 for Albert Fisher, preside... (Steve Griffin | The Salt Lake Tribune) Tom Riemondy, Albert Fisher's great-great-grandson, stands inside the Fisher Mansio... (Steve Griffin | The Salt Lake Tribune) Views to the northwest from inside the Fisher Mansion in Salt Lake City. (Steve Griffin | The Salt Lake Tribune) Some of the woodwork in the Fisher Mansion in Salt Lake City. (Steve Griffin | The Salt Lake Tribune) Views to the southeast from inside the Fisher Mansion in Salt Lake City . (Steve Griffin | The Salt Lake Tribune) Tom Riemondy, Albert Fisher's great-great-grandson, stands inside the Fisher Mansi... (Steve Griffin | The Salt Lake Tribune) Tom Riemondy, Albert Fisher's great-great-grandson, stands inside the Fisher Mans... (Steve Griffin | The Salt Lake Tribune) Tom Riemondy, Albert Fisher's great-great-grandson, climbs stairs inside the Fish... (Steve Griffin | The Salt Lake Tribune) Views to the northwest of the Fisher Mansion carriage house. (Steve Griffin | The Salt Lake Tribune) The Fisher Mansion in Salt Lake City, pictured Wednesday, Nov. 8, 2017. (Steve Griffin | The Salt Lake Tribune) The Fisher Mansion in Salt Lake City was built in 1893 for Albert Fisher, president of the Fisher Brewing Company. (Steve Griffin | The Salt Lake Tribune) Tom Riemondy, Albert Fisher's great-great-grandson, stands inside the Fisher Mansion in Salt Lake City on Wednesday, Nov. 8, 2017. Built in 1893 for Albert Fisher, president of the Fisher Brewing Company, the two-story, 12-room house is an example of the Victorian Eclectic style and one of the few residential designs of Richard Kletting, who also designed the Utah State Capitol Building and the original south-shore Saltair. (Steve Griffin | The Salt Lake Tribune) Views to the northwest from inside the Fisher Mansion in Salt Lake City. (Steve Griffin | The Salt Lake Tribune) Some of the woodwork in the Fisher Mansion in Salt Lake City. (Steve Griffin | The Salt Lake Tribune) Views to the southeast from inside the Fisher Mansion in Salt Lake City . (Steve Griffin | The Salt Lake Tribune) Tom Riemondy, Albert Fisher's great-great-grandson, stands inside the Fisher Mansion in Salt Lake City on Wednesday, Nov. 8, 2017. Built in 1893 for Albert Fisher, president of the Fisher Brewing Company, the two-story, 12-room house is an example of the Victorian Eclectic style and one of the few residential designs of Richard Kletting, who also designed the Utah State Capitol Building and the original south-shore Saltair. (Steve Griffin | The Salt Lake Tribune) Tom Riemondy, Albert Fisher's great-great-grandson, stands inside the Fisher Mansion in Salt Lake City on Wednesday, Nov. 8, 2017. Built in 1893 for Albert Fisher, president of the Fisher Brewing Company, the two-story, 12-room house is an example of the Victorian Eclectic style and one of the few residential designs of Richard Kletting, who also designed the Utah State Capitol Building and the original south-shore Saltair. (Steve Griffin | The Salt Lake Tribune) Tom Riemondy, Albert Fisher's great-great-grandson, climbs stairs inside the Fisher Mansion in Salt Lake City. (Steve Griffin | The Salt Lake Tribune) Views to the northwest of the Fisher Mansion carriage house. In 1884, when Albert Fisher needed a reliable water source to launch his Fisher Brewing Co., he embraced a small section of the Jordan River near 200 South and 1200 West in Salt Lake City. The river — more pristine than it is today — served the German immigrant well, as his company became one of the largest breweries in the West. Fisher showcased his new wealth by building an elegant, two-story Victorian mansion next to the brewery for his wife, Alma, and their five children. 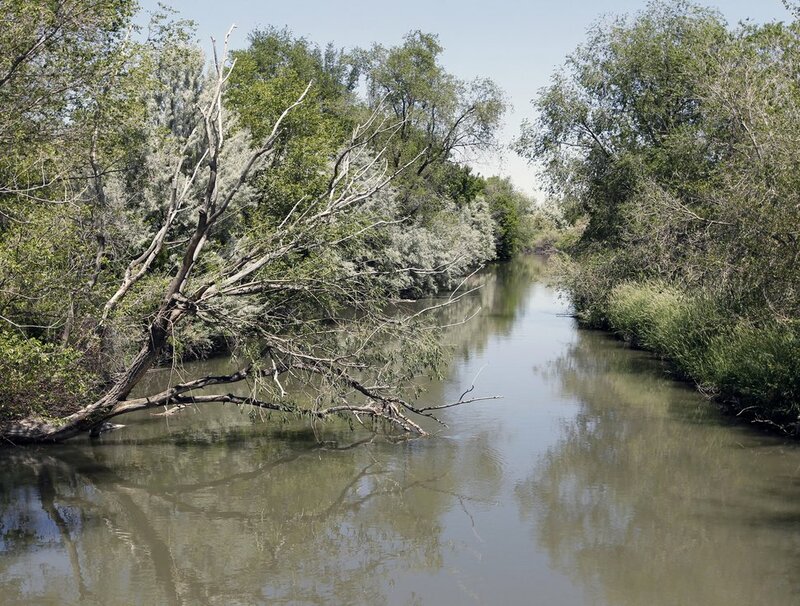 Just as it did some 130 years ago, the Jordan River could once again aid Fisher. This time the waterway — and a soon-to-open recreation path nearby — could bring much needed attention to the now-historic home and its need for restoration. At the time it was purchased, Salt Lake City planned to use only a small strip of the property for the trail and then sell the home and carriage house. However, when then-Salt Lake City Mayor Ralph Becker was elected, one of his first priorities was to keep the historically significant structure and convert it into public use. (Steve Griffin | The Salt Lake Tribune) Tom Riemondy, Albert Fisher's great-great-grandson, walks inside the Fisher Mansion in Salt Lake City on Wednesday, Nov. 8, 2017. First there would need to be a major renovation that includes seismic upgrades, improvements to electrical and plumbing systems and restoration of walls, floors, doors, windows and the grand staircase in the center of the home. The total cost is estimated at more than $3 million. Members of the Fisher family lived in the home until 1940, officials say. In 1944, it was donated to the Roman Catholic Church and was used as a convent until 1973. Later, the church turned the building into a shelter for homeless men, and it remained a boarding house until Salt Lake City purchased it. The partners considered the old Fisher home as a site for their new brewery. “We thought it would be cool to be part of the history,” Riemondy said, “but the cost of renovating was too much.” Ultimately, they decided to renovate an old auto-body shop at 320 W. 800 South. Six public and private groups pitched in to pay for the project, including Salt Lake City, Salt Lake County, the Utah Legislature, Union Pacific Railroad, the Jordan River Commission and the Utah Division of Forestry, Fire and State Lands, he said.